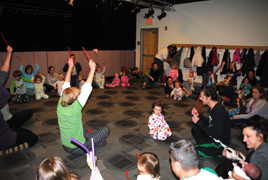 Our First Notes teachers provide 45 minutes of fun-filled live music entertainment at your home or at our school! Parties may be hosted by one performer or two performers (two performers recommend for parties with more than 10 children). Select a First Notes location to book your party!